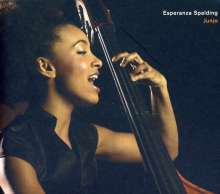 Der Artikel Esperanza Spalding (geb. 1984): Junjo wurde in den Warenkorb gelegt. Esperanza Spalding is here to stay. Bassist, singer and composer, she began playing in small jazz and blues venues around her hometown of Portland, Oregon. A Berklee College of Music Graduate and Instructor, Spalding has worked with such notable artists as Michel Camilo, Dave Samuels, Regina Carter, the Boston Pops Orchestra, Pat Metheny, and Terri Lyn Carrington and Patti Austin, and recently toured Mexico with Joe Lovano. She is the 2005 recipient of the prestigious Boston Jazz Society scholarship for outstanding musicianship. At only 21 years of age, she's most similar to what is known as a "total musician." In addition to singing and playing the bass, she is a composer and does all of her own arrangements. She also arranges her own versions of works of important contemporary composers. In JUNJO, the first musical production under the direction of this American artist, Esperanza gives her touchs to pieces that range from the modern jazz trio to contemporary Brazilian music, to Argentine folk music. For her, this project is a dream come true. It is as a same time, her first CD as well as the first production under her direction.